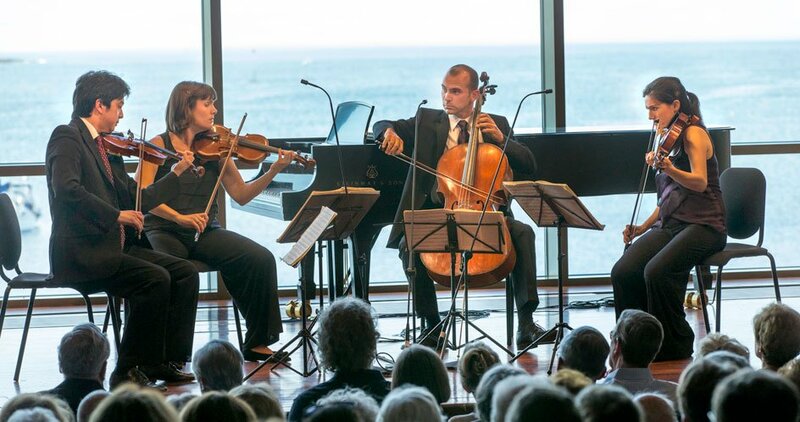 In the first of two appearances during the opening week of this season’s Chamber Music Festival at the Shalin Liu Performance Center in Rockport, the Jupiter String Quartet presented a well-chosen program of works by Schubert, Britten, and Dvořák, played with verve and stylistic acuity. Schubert’s Quartet in E-flat Major, D87, is a youthful work, composed in 1813 when he was sixteen and still a student at the boarding school associated with the Imperial Court Chapel. He had begun playing the violin at an early age and by this time already composed at least ten string quartets for performance by his fellow students or the family quartet, in which he was joined by his father and two brothers. Schubert’s models were the quartets of Haydn, Mozart, and Beethoven, although probably not the latter’s ground breaking (and virtuosic) “Razumovsky” quartets of 1806, but he struggled to absorb their techniques of large-scale tonal design and varied quartet texture. The E-flat quartet, however, is a delightful work on its own terms; the four movements, although all in the home key, nevertheless provide dramatic contrasts in mood, texture, and tempo. The Jupiter players performed the Allegro moderato opening movement with a hint of Viennese lilt to its contrasting motives, an impassioned outburst in the brief development, and an added sense of warmth savoring a different set of chromatic touches in the recapitulation. The brash Scherzo, Prestissimo, its violent leaps and sharp accents alternating with rushing scales, demands a well-coordinated ensemble, particularly as the texture is thickened by double stops and offbeat rhythms. The Trio, in C minor—one of those other-worldly interludes akin to similar movements in Schubert’s late quartets and in the two-cello quintet—brought hushed mystery in the two violins (Nelson Lee and Megan Freivogel) over arpeggios in the viola and a lugubrious double drone in the cello. Warmth of tone color and sensitive melodic shaping characterized the Adagio, which never lost the underlying sense of forward movement implied by the 6/8 meter. The players seemed to revel in the sheer tunefulness of the rollicking quick time Allegro Finale, in which first violinist Nelson Lee led the ensemble in a glorious chase. Benjamin Britten composed his String Quartet no. 1 in 1941, during a three-year stay in the United States that brought him into close and fruitful contact with the overlapping circles of composer Aaron Copland and poet W. H. Auden, and netted him a commission from the Library of Congress patroness Elizabeth Sprague Coolidge. The quartet is a study in moods and textures. In the first movement, tentative, improvisatory sections (Andante sostenuto) featuring violin harmonics and cello pizzicato—other-worldly atmospherics—alternated with more straightforward Allegro vivo passages. The second movement, Allegro con slancio (dash, verve, impulse), was a vigorous march that brought forth unbuttoned yet rhythmically disciplined ensemble playing from the Jupiter. The lyrical Andante calmo that followed was simply beautiful, with a sustained solo for the first violin echoed in a full-throated ensemble and a fine viola solo by Liz Freivogel. The Jupiter players excelled in the finale, Molto vivace, reflecting Britten’s newly found interest in the music of Bach in its fast-paced contrapuntal intricacy. In 1892 Antonín Dvořák sailed for New York to take up the position of artistic director of the National Conservatory of Music, with the charge of helping inspire a new, national American style of music. By 1895, however, the money had run out and homesickness for his native Bohemia had taken over. Begun in the United States, the A-flat major Quartet, Opus 105, was completed at home in 1895, and bore no apparent traces of the African-American and American Indian tunes and rhythms that inspired such works as the New World Symphony. In its recitative-like, improvisatory search for harmonic definition the brief Adagio introduction recalled the opening of the Britten quartet heard earlier in the program; in the busy Allegro, the ensemble never allowed the density of melodic and rhythmic ideas to obscure the overall design. The Molto vivace Scherzo brought a tumble of syncopations and sharp accents and a near-orchestral density of sound that showed off the exemplary cohesion of the ensemble. The emotional core of the quartet was certainly to be found in the third movement, Lento e molto cantabile, a soaring aria for the first violin with ingenious doublings and countermelodies in the second violin and viola, culminating in an expressive melody in the cello’s upper range, beautifully played by Daniel McDonough, that hurtled down to murmuring triplets on low F. An ominous figure in the cello opened the final Allegro ma non troppo in the manner of a brief introduction, bringing the quartet to a cyclic conclusion with a reminder of its recitative-like opening. There was much to enjoy in this quartet evening. Thoughtful programming, which juxtaposed stylistically diverse yet conceptually compatible works; secure and confident ensemble playing by players who seemed totally and naturally at ease with one another; clearly articulated yet warm and mellifluous tone that was vigorous yet never harsh or forced. If their sound seemed occasionally a little dry, one couldn’t help wondering whether a more resonant acoustic ambiance than that of the beautiful Shalin Liu auditorium might have done fuller justice to this fine ensemble.